For those of us who love Orguss with its strange super-dimensional storyline and beautifully designed mecha (thank you, Kazutaka Miyatake), the need to collect every possible scale, color variation, and bootleg is impossible to suppress. That’s why, in January 2015, when local shop owner and toy expert Joel Kubin (Socal Toys, Orange, California) brought SchoolbotTM out from behind the case, he knew I would be an interested buyer. Instantly a Space/Time Oscillation Bomb went off and I was transported to another dimension. 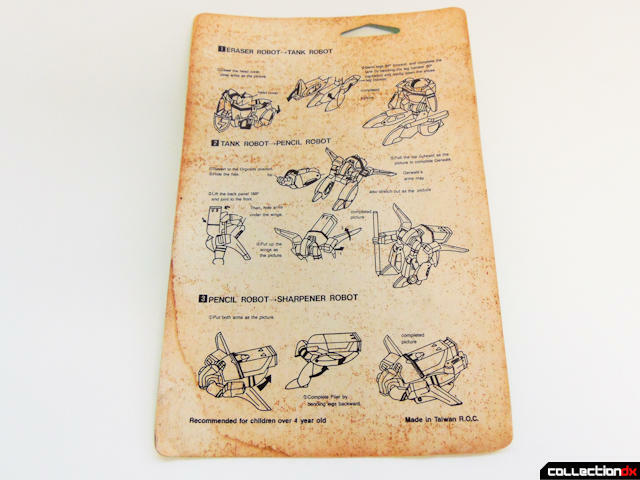 Schoolbot is similar to other bootleg 1/80 Orguss toys released in the mid-1980s. Made from cheap plastic, this example has a few missing stickers and mostly tight joints. Articulation is basic but it does transform into one of four modes as promised on the packaging. It’s a decent mold for a toy this small and details are comparable to the original Takatoku toy. The front of the card explains it all. It’s a robot. It’s a pencil sharpener. 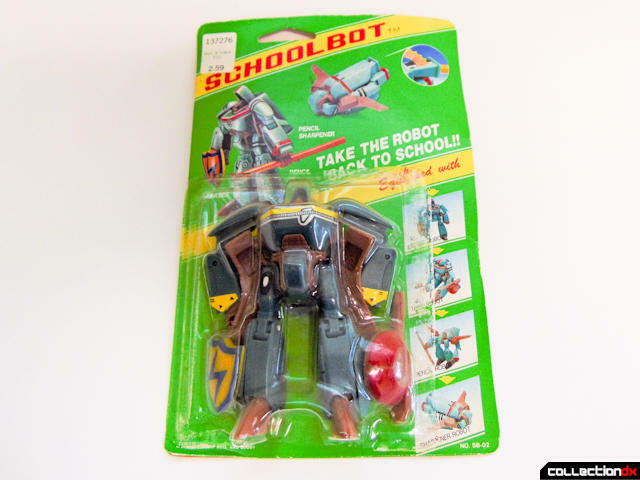 Made in Taiwan copyright 1985, Schoolbot is priced at $2.59 ($5.71 in 2016 dollars). The bubble once housed a small pencil, now missing. 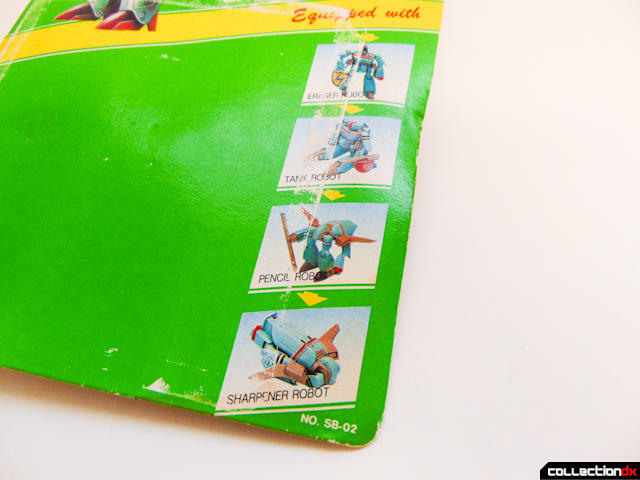 A pencil sharpener is stealthily incorporated into the back section of the armor. No Orguss review is complete without some reference to its vastly more popular cousin and predecessor Macross. Sure, Super Dimension Fortress Macross is a hugely successful franchise spanning multiple TV-series, movies, games, manga, art books, fan conventions, and toy lines. Takatoku, Bandai, and Hasbro have sold millions of the iconic Valkyrie (Jetfire) while Orguss, with all its other-worldly weirdness and complicated (fragile) designs, fell flat and forced Takatoku into bankruptcy. Macross is still adored worldwide, supported by a new TV show and a new line of Hi-Metal toys from Bandai. 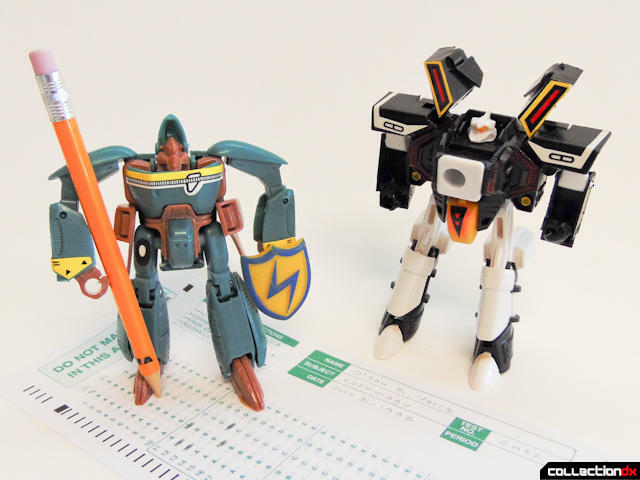 And yes, Macross has the SDF-1 and enough ace pilots to defeat any alien army- but when’s the last time a Valkyrie helped you pass your algebra class? 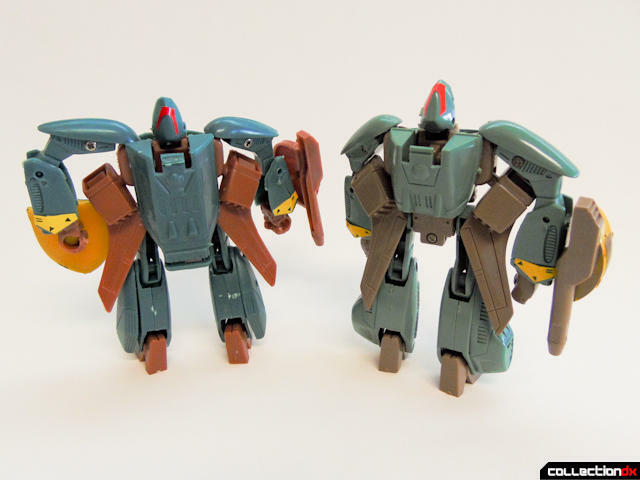 Like other “Convertible Robot” bootleg Orgroid toys of the era Schoolbot SB-02 transforms from robot to flier to GERWALK to tank. 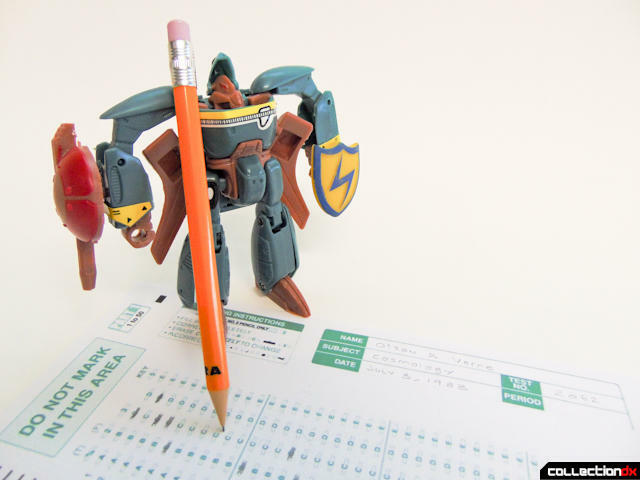 More than a quadruple changer, SB-02 comes equipped with a pencil sharpener, rubber eraser shield, laser cannon, and small pencil (reproduction replacement shown here). Take that, Armored Valk! 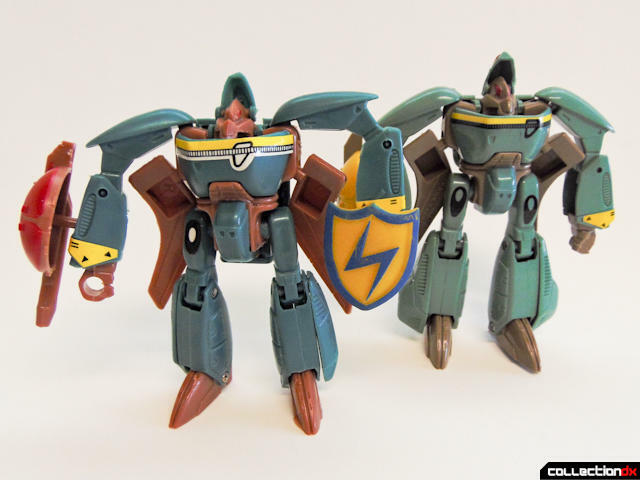 For many fans and collectors Orguss is an obscure franchise, often impossible to find, a relic of a by-gone era, an expensive and acquired taste. It took me years to complete my Orguss Takatoku collection so at this point a bootleg of a bootleg seems unnecessary. But, imagine you’re a kid in 1985. You’re taking the final exam and your pencil lead breaks. With 10 minutes on the clock and half of your Scantron still incomplete, you do not have time to waste! Borrowing a sharpener this late in the game is out of the question. Instead, Schoolbot is there to save the day. A+ on your math final? Guaranteed! Hiding behind a 30-year old unglued bubble on a warped card I could immediately tell that Schoolbot is not your standard Orguss toy. Instead, maybe this was a mysterious offering from a 1980s Scholastic catalog, or dead stock from a Taiwanese party supply store? 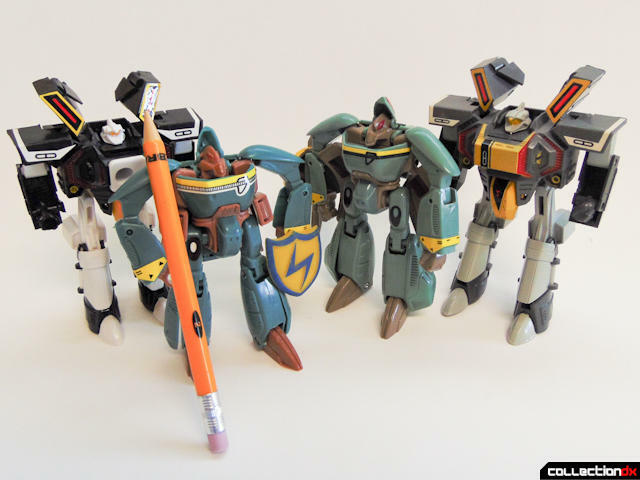 In all my years collecting I had never seen Orguss-themed school supplies. But there he was, ready to fight the Chilam and conquer complex binomials. Not since Kronoform (or maybe Perceptor ) have kids had a better excuse to take their toys to school. I reviewed SB-02 (Drifand Orguss Orgroid II - Olson Special) and SB-03 (Gerwalk Nikick MBG-24C). It is likely that this same company produced an SB-01 (Key’s Drifand Orguss Orgroid) – the regular 1/80 Orgroid was released by Takatoku and as a bootleg. And so the hunt for more Orguss toys continues.